Tallgrass prairie once reigned throughout the state of Iowa. Composed of more than 300 species of wildflowers, it is an amazingly resilient perennial ecosystem. Dense and diverse, it can withstand extreme temperatures, browsing from animals such as bison and elk, many weeds, and erosion from heavy rain and strong winds. A recently seeded prairie, however, is not nearly as resilient, and must be managed as closely as a crop field. Before the perennial roots have had time to take hold, young prairie seedlings can be shaded and squeezed out by fast-growing weeds. 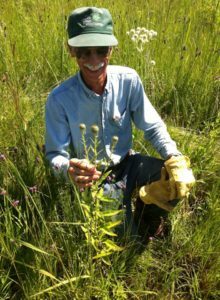 Author and naturalist Carl Kurtz identifies a rare Hill’s Thistle in a remnant prairie in Story County, Iowa. In A Practical Guide to Prairie Reconstruction, Iowa author and naturalist Carl Kurtz emphasizes that without mowing, the only species to survive are those that can tolerate limited sunlight and moisture conditions. Kurtz shares this anecdote from Maddux and Hildebrand, “One area that was unmowed had only eight species, while a mowed area had 27 species.” Successful prairie establishment depends on timely mowing during the first three years. 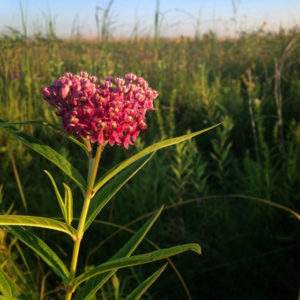 This blog post will provide you with the technical knowledge for essential weed management in a prairie restoration. Aim to mow at a height that will cut off weed seed heads and allow sunlight to reach the prairie underneath. The rate of growth of both weeds and prairie plants depends on weather and soil conditions. Observation will be your greatest asset when it comes to determining the timing of mowing. When to start: If fall seeded, mow for the first time in early to mid-June. If summer seeded, mow when weeds reach a height of 12 to 15 inches. Mow two or three times, each three weeks apart, at a height of 3 or 4 inches. Then, raise mower to six inches and mow as needed until late summer when weed pressure is no longer an issue. Cut at 6 to 8 inches, as needed, depending on height of weeds and prairie. Biennial and perennial weeds will have begun to be a larger issue. Make sure to cut the seed heads off of weeds such as curly dock, and cut off the flowering stalks of invasive grasses such as reed canary and smooth brome to limit regrowth. In March or April of the third year, the residue is likely to be substantial enough to facilitate a prescribed burn. This can be an excellent way to control certain undesirable, aggressive cool-season species such as brome grass, and enable a larger diversity of species to thrive. Certain species of prairie plants even require fire for seed germination. If it is not possible to burn in the third year, mowing once, at a height of several inches, is a good alternative. 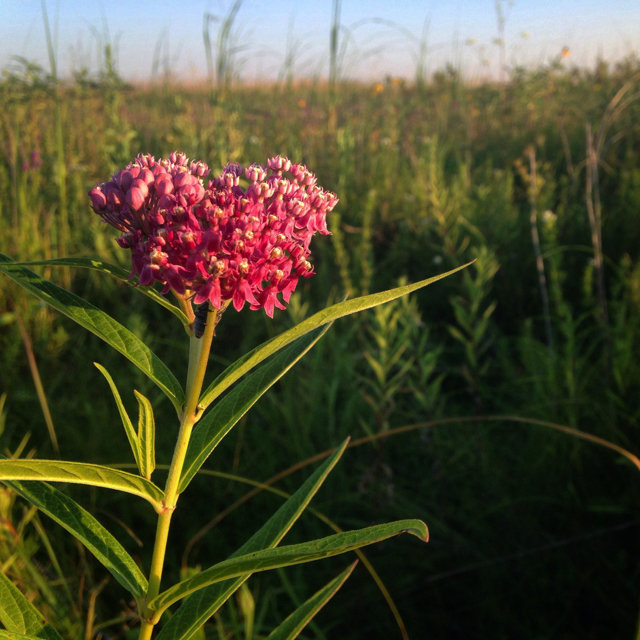 Restored prairie creates critical habitat for pollinators, birds, and other wildlife. 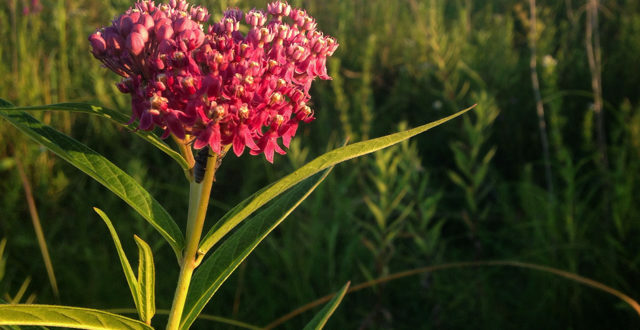 This swamp milkweed thrives around prairie wetlands. The flowers feed many species of butterflies and pollinators, and the foliage provides a food source for monarch caterpillars. Prairie evolved with periodic disturbance from fire and brief, intense grazing from large herds of animals. Mow or spring burn your prairie every 2-3 years to promote the continuation of a diverse native plant community. Strategic spot mowing of certain weeds can be an effective form of weed control in some cases—for example, sweet clover can be managed by mowing it at bloom stage. A rotary mower is preferable to a sickle-type mower, as the shredding motion of rotary blades cut the weeds into small pieces that are less likely to bury young prairie seedlings. Make sure to mow frequently enough that the weeds have not grown too large; even rotary mowers can create piles or windrows of cuttings that can smother seedlings, if the vegetation is too dense. 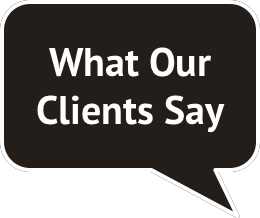 A special thanks to Carl Kurtz for all of the valuable information he has shared, which forms the foundation of this blog post. For excellent, detailed information on each step of the prairie reconstruction process, we recommend the book A Practical Guide to Prairie Reconstruction by Carl Kurtz. For prairie plant identification during reconstruction, we recommend The Tallgrass Prairie Center Guide to Seed and Seedling Identification in the Upper Midwest by Dave Williams and Illustrated by Brent Butler.